Fourth Row Center: Film Writings by Jason Bailey: On DVD: "Che (Criterion Collection)"
Hopes were perhaps impossibly high when director Steven Soderbergh and star Benicio Del Toro announced, following the Oscar-winning triumph of Traffic, that they would re-team for a biographical portrait of revolutionary leader Ernesto "Che" Guevara. Based on their previous collaboration, it seemed like a perfect marriage of material, filmmaker, and star; by the time the project finally arrived, nearly a decade later (a decade in which Soderbergh had continued his exciting experimentation into the very form of cinema), many of his admirers (myself included) were anticipating Soderbergh's masterpiece. It is not that. Perhaps the dashing of those expectations was what led to its generally lukewarm reception by critics (again, myself included), but even taking its considerable flaws into account, there is still much in it to admire. The sheer ambition of the project, and the skill with which it is navigated by Soderbergh and Del Toro, is astonishing--here we have a film in two parts, each running 2 and a quarter hours, originally shown back-to-back as a "road show" for Oscar consideration in December 2008 before a release (split into its two parts) in January of the following year. Most biographical films (even one as long as this one) have to heavily condense events in order to smash everything in. Soderbergh instead chooses to tell Che's story unconventionally, by taking three key events in his life (the Cuban revolution, his 1964 address to the United Nations, and the failed Bolivian revolution that led to his death at 39) and blow them up, in an attempt to make us understand him purely through those particular moments. It is a unique way to make a film about the man, instead of the things that happen to him. Intellectually, this is an interesting proposition, and I see the value of this very experimental approach, even while noting that it doesn't quite land--at least not for the entirety of both films. Taken on its own, Che Part One (also known as The Argentine) is actually very strong; a difficult film, no doubt, and an easy one to get lost in, but absolutely compelling all the same. Soderbergh intercuts Guevara's trip to the New York (shot in high-contrast black-and-white) with the beginning of his life as a revolutionary, making the marvelous choice to jump off the movie with the initial meeting of Che and Fidel Castro (a quiet scene at a small dinner party). We then follow the men into the jungle, through the extended, bloody fight of the Cuban Revolution. Soderbergh is clearly fascinated by the intricacies of guerilla warfare (as detailed in Guevara's writings), as well as in turning the expected "war movie" clichés on their head; the battles here are sudden, brutal, and immediate, but also not immune from the director's experimentation (in one memorable, early firefight, he removes all of the sound effects and has the battle play out under an interview from the New York trip). The film culminates with the taking of Santa Clara, an extended, remarkable sequence that is thrilling and somewhat moving (and is followed by a strange and unexpected coda). The second film begins six years later, telling us precious little of what happened in between. Che Part Two (aka Guerrilla) deals, almost exclusively, with Guevara's attempt to lead the ultimately doomed Bolivian revolution; the storytelling here is much more linear, with no artsy New York stuff to cut away to. The problem is that, as viewers, we might have welcomed the escape. We spend about two-thirds of the first film in the jungle and even more of the second, and by the middle of that second film, the viewer is, well, rather tired of being there. I see what Soderbergh was going for here--first we see a successful revolution, and why it was successful, and then we're shown the later, unsuccessful one as a counter-point. I get that. I'm just not sure that he realizes that we get it, and he keeps us there too long. If I may mangle an aphorism, he doesn't see the jungle for the trees. Soderbergh has always been a filmmaker fascinated by process (one of the pleasures of his infinitely pleasurable Ocean's films is that they let us peek in on the process of assembling the heist), but in Che, his fascination with the sheer process of guerilla warfare somewhat undermines the momentum of the picture. There are amazing moments in the second half (particularly in Del Toro's masterful portrayal of Guevara's weakening health), but they are surrounded by long stretches in which not much happens. But much of that can be forgiven in light of the richly rewarding closing passages; the last twenty or so minutes of the story are just plain flawless, a beautifully crafted and exquisitely acted portrait of the end of a journey. Del Toro shines here, as does Soderbergh's great-looking digital videography (under his pseudonym Peter Andrews). To some degree, that terrific payoff eases the labored build-up. Soderbergh's motives are honorable; each film, for example, begins with an "overture" in the style of the old sweeping epics, which immediately reminded me of Lawrence of Arabia, a film not dissimilar (in theory) to this one. His aim, it would seem, is to make an epic biography like that film, but to do it on more personal terms and in a more intimate way, and he almost pulls it off. But in its second half, Che occasionally pushes too far in the other direction, becoming so unconventional that it borders on alienation. This is not to negate the experimental tendencies of the film, or to suggest that a more conventional approach would have been more successful. It does no good to bemoan the film that wasn't made; let us, instead, examine the one that was. Che is intimate, personal, moving, and occasionally thrilling. It is also long, dry, bewildering, and periodically inaccessible. It makes you do some of the work--more, surely, than most viewers are willing to do. But what it does, it does very, very well. My first viewing of Che, over a year ago, left me feeling disappointed and somewhat bewildered (reflected in my harsher original review). It worked better for me on this second viewing, and I'm not sure why; either my expectations had been recalibrated, or the film is so specific and detailed that it takes additional viewings to take it all in. (Another factor: I originally watched both parts back-to-back, as Soderbergh said was his preference, whereas this viewing separated the two parts by a full day--in my opinion, a much smarter way to take in the potentially repetitive material.) 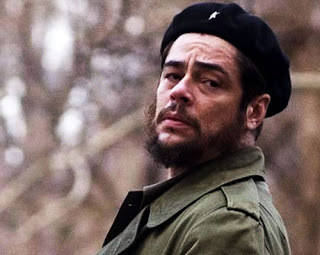 Whatever the reason, while I'm still not sure I can explain or justify all of Soderbergh's choices, I can say that Che is a fascinating, intelligent picture--and like, many of our finest (and most challenging) films, it is admirable for both its strengths and its flaws. "Che (Criterion Collection)" hits DVD and Blu-ray on Tuesday, January 19th. For full Blu review, including audio/video and bonus features, read this review at DVD Talk.